Vertical blinds are some of the most preferred type of window blinds. Vertical blinds are some of the most preferred window decorations. You may have a set installed yourself, or know someone close to you that’s using them. This is because of how versatile vertical blinds are. They come with many advantages, which offset the drawbacks of other blind types. All of our blinds are supplied with a child safety device as standard to comply with EN13120 regulations. A vertical blind extends from top to bottom. When drawing open such blinds, they move sideways. This allows you to effectively hide the blind’s looks in large spaces, if you wish so. Since such blinds don’t require lifting, they’re easy to operate. 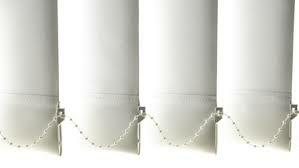 They work well for windows and doors that slide sideways for opening. Often, balcony or backyard doors are slide operated. If you’re a home owner, you’ll need vertical blinds for those. But also, vertical blinds are suitable for large office windows. Especially for tall buildings, where glass is used as a substitute for street-facing walls. A vertical blind is suspended from top to bottom. You do not need 2 rails to hold the blind, like with a venetian blind. Thus, the fabrics on a vertical blind can be easily moved around for cleaning. Also, you can clean them with ease. With a vertical blind, there are no worries about ruining a nice fit. Also, there are less worries about jamming curtain cords. Vertical blinds come with wands to control their rotation. All you must do is rotate the wand, effectively changing the angle of all blinds. Wands ensure that your blinds are rotated in alignment. It ensures symmetry between each blind at all times. Usually, vertical blinds are designed using thick fabrics. This is due to the sheer size and space they cover. As a result, vertical blinds have a longer life than most blinds. Vertical blinds are more durable to breakage. And due to their hanging disposition, they can sustain being pushed around without problems. Do note that LA Blinds offers fabrics that are moisture and mould resistant. Our fabrics are suitable for rooms that experience high humidity. And with mould resistance, cleaning is easy and infrequent. Vertical blinds are excellent for thermal insulation. Their thickness and fabric strength allows you to properly regulate room temperature. Such blinds are useful for environments that must be consistently cooled. Vertical blinds act well as motion and air detectors in public spaces. For example, entrances to public offices work well with vertical blinds. LA Blinds is happy to provide you free quotes on the vertical blinds you need. We’ll help you choose the fabric, colours, and type of headrail you need. Also, we’d be happy to send experts to do the measuring for you. Simply contact us to arrange an appointment.